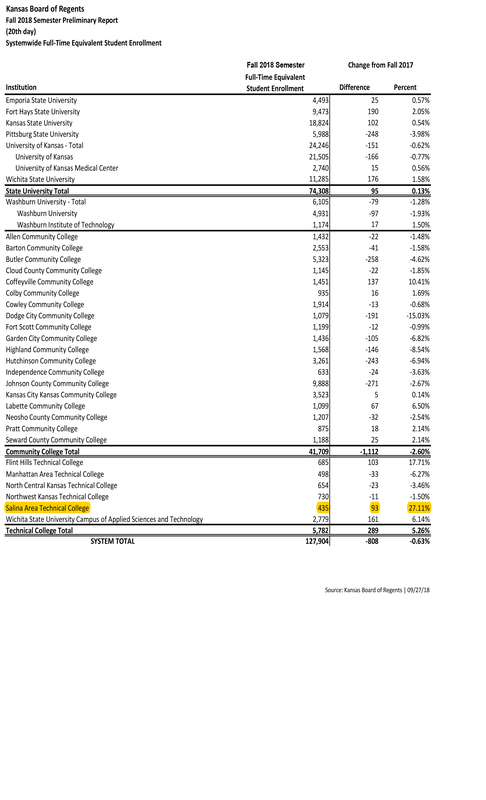 Enrollment at Salina Area Technical College rose 27% in the fall of 2018 compared to the previous fall, according to information collected on September 20th for reporting to the Kansas Board of Regents. According to the enrollment data, Salina Tech had a total of 435 Full Time Equivalent students, compared with 342 at this time in 2017. FTE is calculated by taking the total number of students enrolled and dividing by 15 credit hours, which is considered a full-time class load. In the past, the Kansas Board of Regents has relied on “headcount,” which is the total number of students enrolled, but switched to using the FTE method starting this fall. Under the previous “headcount” method, Salina Tech’s enrollment jumped from 598 to 787 – an increase of 31%.